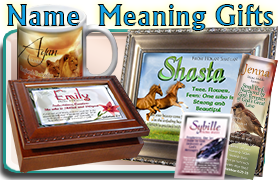 Christian Name Meanings in personalized Music Boxes, decorated with meaningful pictures of faith and inspiration. My favorite is The Old Rugged Cross design, SY42. 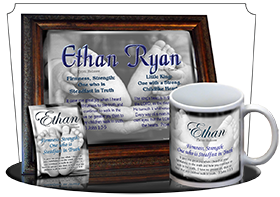 A brilliant sunset shines above the blue water on this personalized name meaning music box. Beside the deep red name and solid name meaning is a weathered anchor, symbolizing faithfulness, dependability, strength and commitment. Honor someone who has been your anchor, or inspire someone to hold to our Anchor, Jesus Christ. The matching bookmark shows a bright orange sunset over the anchor, resting in the warm sand. The name meaning pocket card features angled typography with the name, meaning and verse at various angles, paralleled with the anchor in the picture. NG-MB-SY60 3x7x9 high quality, Name Meaning Music Box with Sankyo movement. The old rugged cross has weathered the centuries, bringing the message of God's love, and hope to the hopeless. 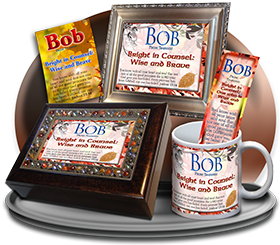 Encourage someone with a music box that plays a classic hymn and shares the rich treasure found in their name meaning. 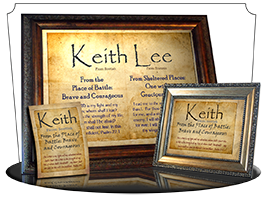 The matching bookmark, pocket card and greeting card all show the same cross and old parchment background, and even the inscription inside the lid uses the old parchment, too! NG-MB-SY42 3x7x9 high quality, Name Meaning Music Box with Sankyo movement. 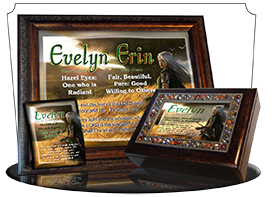 An elegant and ornate Celtic knotwork borders this name meaning music box. The Irish knotwork cross accents the corner of this music box, with the name, origin, meaning and Bible verse featured in greens and browns. Add a matching name meaning greeting card, or include a personal message inside the lid of the music box! NG-MB-CE02 3x7x9 high quality, Name Meaning Music Box with Sankyo movement. This enormous anchor rests in a stone courtyard overlooking the blue sea under stormy clouds. An anchor is a great symbol of strength and faithfulness for your personalized music box. 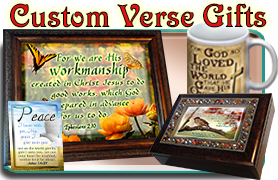 Choose your own classic hymn and encourage someone with a box for treasures and keepsakes. NG-MB-SY59 3x7x9 high quality, Name Meaning Music Box with Sankyo movement. 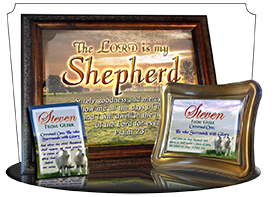 Angelic wings shine with golden light, guarding over the person's name and encouraging name meaning and Bible verse on this personalized music box. The matching pocket card shows a light blue gradient for the name. 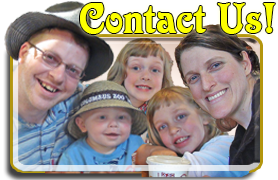 Show your care and encouragement with the Message-Inside feature. NG-MB-SY33 3x7x9 high quality, Name Meaning Music Box with Sankyo movement. Lightly aged parchment adds a look of heritage to this simple, yet traditional music box. I recommend the ornate wood style for the music box, with a personal message of encouragement inside the lid. NG-MB-SM03 3x7x9 high quality, Name Meaning Music Box with Sankyo movement. I really like this music box design. Shiney black stones are stacked in the foreground, with colorful brown stones in the background. Betwixt the two are unique fonts for the name, meaning and verse. 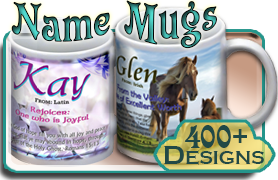 The all-caps font for the name & meaning includes flourishes and design accents on the letters. 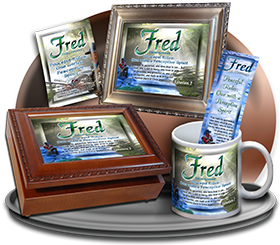 This makes a great treasurebox for a man, with a classic hymn and the ornate-wood style of box. The matching pocket card shows three white stones stacked on a sandy beach against blue ocean water. NG-MB-SY15 3x7x9 high quality, Name Meaning Music Box with Sankyo movement. Silver blue butterflies accent the corners of this blue music box picture. 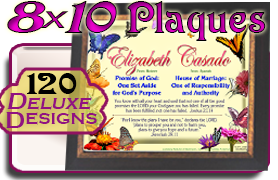 Customize it with the Jeweled Silver music box to make it a simply beautiful gift of encouragement. NG-MB-BF02 3x7x9 high quality, Name Meaning Music Box with Sankyo movement. Golden warm light emenates from a unique water-flame on this wax candle. 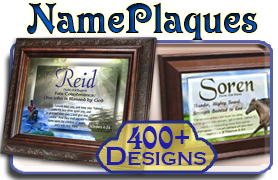 It is a unique picture, with stylized fonts to highlight the gold text of the name and name meaning. 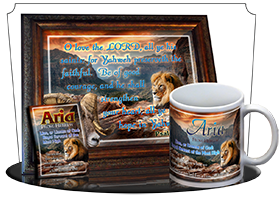 The origin and Bible verse are in a white text. The matching bookmark features the same candle with a red-glow in the background, and the name and meaning in a sunset orange. 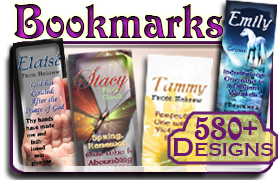 There is no room for the verse on the bookmark, but the verse reference is at the bottom. NG-MB-SY25 3x7x9 high quality, Name Meaning Music Box with Sankyo movement. A stack of stones is simple, but presents as a symbolic and meaningful name meaning gift. 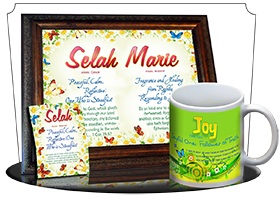 Choose a classic hymn or contemporary "On Eagles Wings" tune for this music box, and personalize it even further with an encouraging message inside the lid. NG-MB-SY14 3x7x9 high quality, Name Meaning Music Box with Sankyo movement. 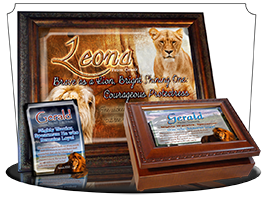 This memorial box plays your choice of hymns, and features the name in an elegant blue font against the soft sunset. 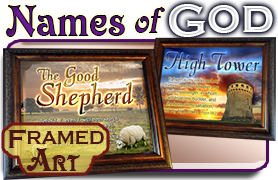 An image of the Good Shepherd holding a lamb, next to a sheep that walks wit him towards heaven's light. 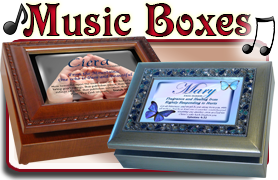 This makes a lovely memorial gift, especially with our Ornate wood design for the music box. Please note if it is for a memorial so we can choose a suitable verse. Or you may specify your own verse. Also, please consider the "Message inside lid" inscription option, which allows you to add a personal sentiment inside the lid, to be seen every time the music plays. NG-MB-AN34 3x7x9 high quality, Name Meaning Music Box with Sankyo movement. A beautiful landscape scene for a Graduation Keepsake Music Box, reflecting a message of standing up against peer pressure. Also a wonderful symbol of God's provision and specific plan for each seed He plants in our lives. NG-MB-TR10 3x7x9 high quality, Name Meaning Music Box with Sankyo movement.